We are in the midst of a massive LEGO collecting spree. In that theme, as Noccie mentioned, we ventured to Wal Mart and found nothing of value except the LEGO Ninja Turtles sets. 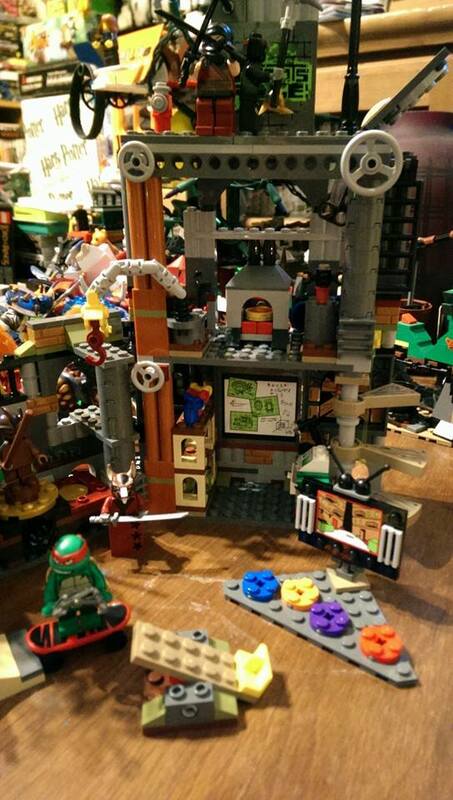 Here is a look at the Turtle Lair Attack! The part I call “Splinters Grotto”. 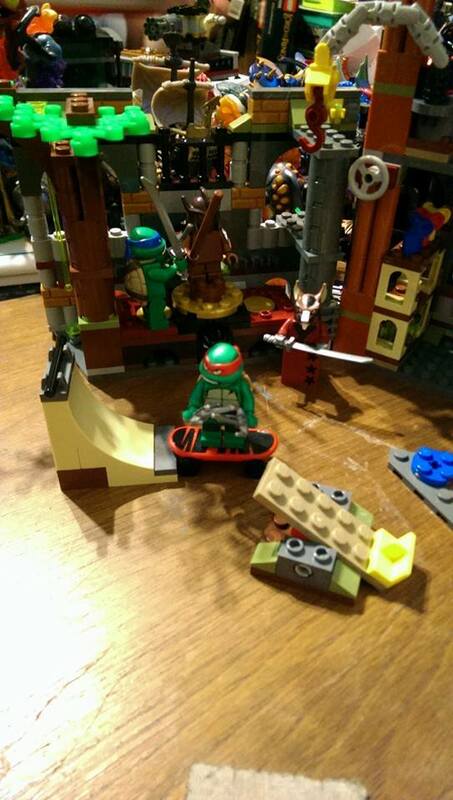 Pictured is the “left” side of the set as well as the skateboard ramp and ninja-launcher. Nice build with a great tree and slime drips. The Shredder dummy is a nice touch and turns with a little gear on the front. The “tall part”. Yeah, I got nothin. Lots of neat little sciency doo-dads on this part. A TV with uh…color coded seats? OK, sure. Why not. Bottom level has a chalkboard with a blow away wall that pulls off with a little dial on the back. Nice little feature! Middle level has a pizza oven that flicks the pizza out. Gimmicky but…its TMNT. Had to have pizza somewhere. To the right of the oven is a skateboard rack. Problem is, the clips are actually TOO BIG for the boards to clip to! Its completely useless, unfortunately, despite being a good idea. Their is a ladder going up to the surface right NEXT TO the opening manhole street section. VERY strange choice of assembly there. The little street vignette is not bad. A fire hydrant, a graffitied wall and a lamp post. Could use a bit more wall to sell it being the surface, but good effect with the layers going down to the sewer proper. Overall, a nice set with lots of nice little touches. The turtles themselves are great. 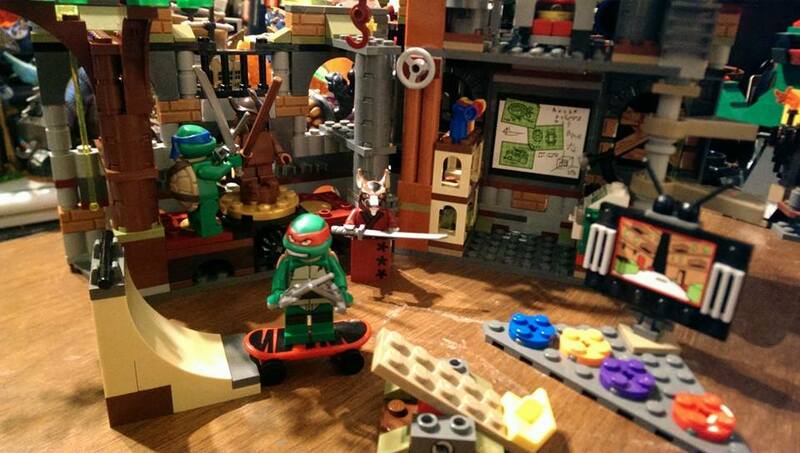 Splinter looks amazing. The evil ninjas are sufficiently ninja-y. Plenty of extra weapons and accessories. A few odd design choices put this in my “get it if its on sale or nothing else is striking your fancy” pile. Worth it for the little characterful touches and the minifigs.